What foods should you eat if you want to keep your prostate healthy? How does sexual activity affect the health of your prostate? What are ways you can prevent prostate cancer? What should African-American men know about prostate cancer? What are the best alternatives to radiation and surgery in treating prostate cancer? What are the symptoms of an unhealthy prostate? These are some of the many important questions that are answered by Dr. Daniel W. Nixon, one of America's premier cancer research institute leaders, and Dr. Max Gomez, the charismatic health commentator whose reports are aired on NBC television stations nationwide. The authors not only provide indispensable guidance in cancer prevention but also offer a dynamic, new noninvasive treatment of prostate cancer. Packed with information, The Prostate Health Program explains in clear, simple language the link between obesity and prostate cancer, the difference between an enlarged prostate and a diseased one, the causes of frequent urination and pain, and the specific prostate problems pertaining to gay men. Drs. Nixon and Gomez offer a user-friendly plan of diet, exercise, and behavioral change that men can easily incorporate into their lives. The authors explain why aggressive treatment, such as radiation and surgery, is often unnecessary, less effective, and more dangerous -- often leaving men incontinent and impotent -- than other treatments. The cornerstones of this unique program are the Prostate Health Pyramid and the Transition Diet, both of which were created specifically for this book and are the ultimate tools in prostate cancer prevention, control, and treatment. First, the foods that protect the health of the prostate are identified; then, food changes are introduced slowly for more effective and long-lasting reform of eating habits. Best of all, quick and easy recipes created by chefs at the Culinary Institute of America provide a menu that is healthy and delicious. 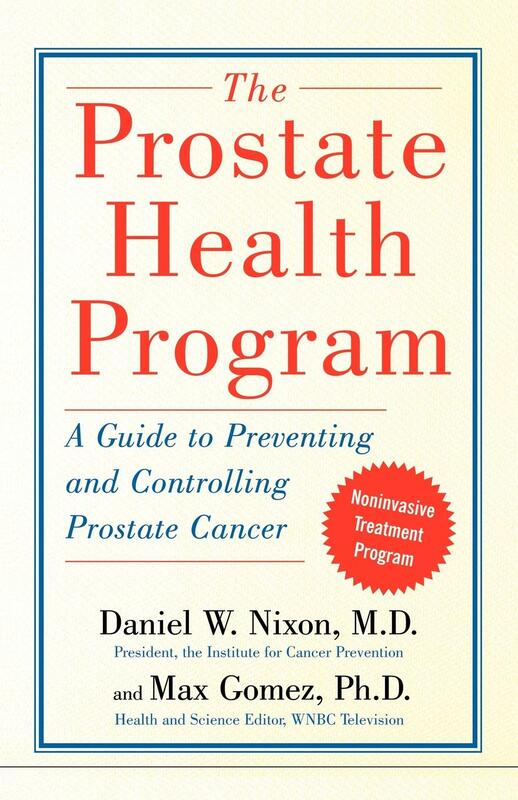 With its combination of cutting-edge research and highly respected, world- renowned authors, The Prostate Health Program is the definitive defense against a deadly disease. Prevention and the editor-in-chief of the journal Preventive Medicine. issues. He lives in Westchester County, New York.